The Optoma EH501 was designed to deliver unsurpassed performance and reliability to meet your installation needs. 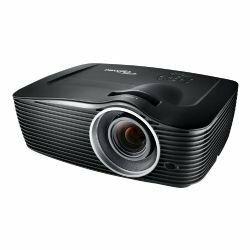 Its powerful 5000 lumens output and impressive 15,000:1 contrast ratio deliver remarkably bright presentations with sharp text and color-rich graphics. To ensure it will perform to your current and future needs, the EH501 features a comprehensive I/O panel and the most advanced feature sets in its class. Outstanding features on this remarkable product include HDMI and DVI for digital connectivity, over-the-network presentation capability, wireless presentation capability via optional USB dongle, vertical lens shift and discrete audio inputs including microphone input for maximum installation convenience. Image Size Diagonal 33.6 - 301.5in. Throw Distance 5.0 - 30 ft.
Dimensions (WxDxH) 15.2 x 11.0 x 6.0in.